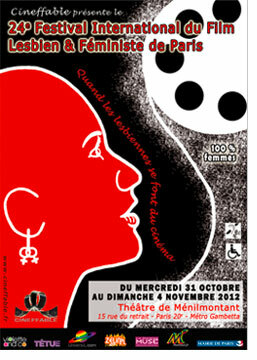 Here we are together (again) for the 24th Paris international lesbian & feminist film festival: quand les lesbiennes se font du cinéma, in a new venue in Paris… and the world. With a selection of shorts and feature-length fiction and documentary films from around the world… including China, India, Jamaica, and Uganda; plus an exhibit with the work of 17 women artists from different horizons, Cineffable creates a unique – because uniquely female – space-time continuum. Because the world is violent for women, and even more so for lesbians: we are meant to be “complementary” to men, workers, slaves, mothers, hookers... but above all, gagged and invisible. Even Outer Space is closed to us (cf. No Gravity)! But by coming out to see these works, and by rubbing up against our real-life community through debates and discussions, and with the help of the memory of our elders, we transmit OUR culture. Our culture is the struggle against the oppressions of the hetero-patriarchy; it’s also what binds us together despite differences and disagreements, and allows us to listen to and respect each other… which we need to do now more than ever. Our culture means following our artists on the path to our share of utopia, holding onto our reality and reinventing our fiction. And our culture means inviting you all – for these 5 days and beyond – to decolonize our imaginations. Year after year, it becomes ever truer: the United States no longer has a monopoly on feature films. This year, we are proud to present an Argentinean comedy, "Lengua Materna" as well as the first-ever lesbian film seen in movie theatres in Thailand, "Yes or No?". We also have "Margarita", which won the 2012 Créteil Women’s Film Festival Audience Award, and the sweet coming-of-age story "Mosquita y Mari" which was part of the official selection at the 2012 Sundance Festival. As unlikely as it sounds, a “lesbian, feminist and... extra-terrestrial” theme has nevertheless cropped up, between the French documentary "No Gravity"* and an off-beat American space oddity in black-and-white that had tongues wagging at Sundance last year, "Codependent Lesbian Space Alien Seeks Same". We have a range of films devoted to major figures of the French lesbian and feminist movements, thanks to the documentaries "Carole Roussopoulos, une femme à la caméra"*, "Un écrivain en terres mâliques"* (entretien avec Michèle Causse) and "Marie-Josèphe Bonnet, histoires d’amours féminines"*. Another important women’s-history documentary: "!Women Art Revolution" provides an overview of feminist art in America from the 1960s to the present day. Equally indispensable are the documentaries showing how hard it can be to live your homosexuality in different parts of the world: "Call Me Kuchu" describes the extremely difficult situation in Uganda; the striking "Taboo… Yardies" tells us what things are like in Jamaica* and, "365 without 377" portrays the evolving situation in India. There is also "Our Story – 10 Years Guerrilla Warfare of Beijing Queer Film Festival"* and the South African "Waited For". Cineffable now has a Transmission commission, which is presenting its first program of short films. The idea is to take a new look at a film, director, theme, year, etc. The fact is that, not necessarily having attended the earliest editions of the festival – or even ones from 10 years ago – many festivalgoers have never had the chance to see certain films that are essential to lesbian history, or simply to get to know certain directors’ work... So we plan to propose one or two “transmission” programs each year. For this first edition, we propose a look at experimental cinema… because when lesbians grab hold of the film camera, intending to change the world, they change cinema! So here is a diverse selection of works from essential experimental women filmmakers’: the pioneer, Barbara Hammer, as well as Katerina Thomadaki who, along with another multi-disciplinary artist, Maria Klonaris, invented Cinéma Corporel ; Laurence Rebouillon, a key figure in French experimental cinema, who, along with Agathe Dreyfus, Aurélia Barbet and Marianne Ploska is part of the Collectif Jeune Cinéma* (Young Cinema Collective). The program will close with an homage to Laurence Chanfro, photographer, protean artist and auteure of numerous experimental shorts whose sudden disappearance this summer affected us deeply.